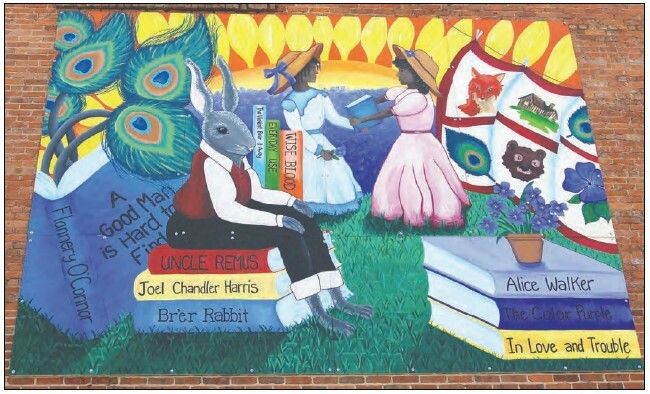 The mural honors authors Alice Walker, Flannery O’Connor and Joel Chandler Harris. 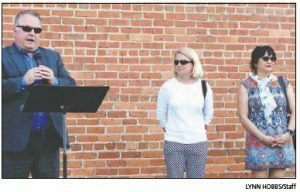 From the first organizer to the final installers and everyone in between – the many people involved in getting the new mural displayed in downtown Eatonton were recognized during a special reveal ceremony Friday afternoon, April 21. The mural, which depicts local famous authors, now hangs on the wall of the Georgia Writers Museum’s future permanent home, next to Farmers and Merchants Bank. 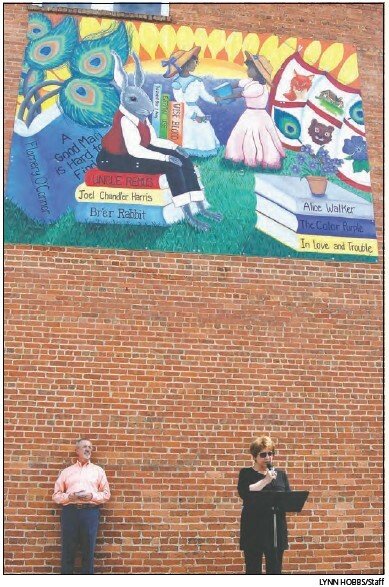 Kevin Tomson-Hooper, left, president of the Artisans Village, listens as Artist Gail Vail describes how the mural, which she designed, depicts the Lake Country’s three most famous authors. One of several designs submitted by local artists, this one by Gail Vail was selected by the community via votes on social media and at art festivals. The mural recognizes the literature of Flannery O’Connor, Alice Walker and Joel Chandler Harris. Putnam County Charter School System Superintendent Eric Arena, left, publicly thanks Putnam County High School art teacher Paige Barlow, center, and Georgia College art professor Valerie Aranda for their guidance of students who painted the mural. 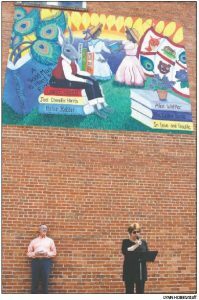 Putnam County Charter School System Superintendent Eric Arena thanked the Briar Patch Arts Council, the Board of Commissioners and the community, “for our students,” he said. Realizing the fruit of their labors are artist/mural designer Gail Vail, PCHS art teacher Paige Barlow, GCSU art professor Valerie Aranda, and PCHS and GCSU art students. Commissioner Alan Foster said he did not realize how many people were involved until he personally attended one of the painting sessions. ”These students will enjoy this forever because every time they look at it, they will remember they were a part of this,” he noted.